Ultimate Jumpers, Inc. has been in the inflatable unit manufacturing business for almost 10 years. With the rise in popularity of indoor playgrounds, the demand for indoor inflatables has gone up. Our new indoor collection differs from the rest of the inflatable products on the market because of its customized sizes and designs. Created specifically for indoor use, these colorful indoor units are great not only for bigger kids but for toddlers as well. 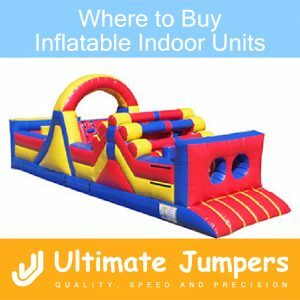 So if you are wondering where to buy inflatable indoor units, you do not need to look any further than UltimateJumpers.com. Although most of our inflatable units can be used indoors (except for the wet units), the inflatables in this collection are created for indoor use with restricted ceiling height. For example, these customized units are 12 feet tall which make them safer for younger kids. In addition, safety of the kids is the main concern for the parents and a priority for Ultimate Jumpers, Inc. The inflatable indoor units that you choose for your indoor playground may make or break the popularity of the playground. Our indoor inflatables are uniquely designed to evoke bright colors and fun designs for kids of all ages. From obstacle courses to jumpers, we have any kind of indoor inflatable you could think of. If you’re wondering where to buy inflatable indoor units, you have come to the right place. In addition, our impeccable customer service will make your experience truly unmatched.